The Marksmanship section conducts fundamental refresher training courses such as Semi-Automatic Pistol 1, Patrol Rifle, and Shotgun Skills training. These courses are designed for the officer who has recently graduated from a Basic Mandate course and needs to enhance marksmanship skills, as well as for the veteran officer who needs a refresher in fundamentals of marksmanship. This section also offers a wide variety of classes to broaden an officer’s skill level with pistols, rifles, shotguns, and submachine guns. Course offerings include Semi-Automatic Pistol II & III, Concealed Carry Handgun, and Submachine Gun training. These classes greatly improve an officer’s knowledge, skill level and confidence in their ability to shoot their weapons. As part of its initiative to offer advanced specialized training, the Marksmanship Section teaches Counter Sniper (levels 1 and 2) courses. Officers attending these training classes must be members of a Special Reaction or S.W.A.T. team or be assigned to a Counter Sniper team. 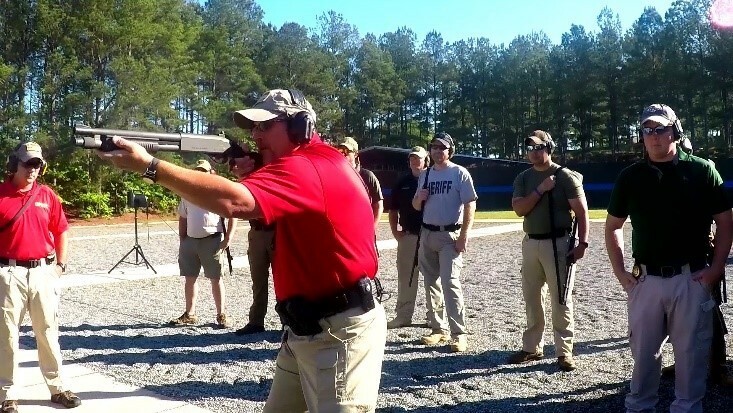 Additionally, the section offers an 80-hour Firearms Instructor class and a 40-hour Shotgun Instructor course. The Marksmanship Section maintains multiple training ranges. They include two 25-yard pistol ranges with 26 targets each, a multiple purpose range with 28 target frames and a running man target system, a reactionary steel range, a crime scene range that includes a live fire house, a 50-yard shotgun range with 44 target frames, a rifle range with 200-yard targets and a long rifle range with targets out to 600 yards. The Firearms Section at GPSTC is one of a limited number of training facilities in Georgia to teach the Reactionary Shooting concept with a four-day advanced training block that is taught as a segment in our Semi-Automatic Pistol III course. All shooting within this block is conducted on our reactionary steel range. The Tactical Skills Section develops and delivers an intense and challenging training curriculum that provides public safety officers with the critical skills necessary to conduct individual daily operations as well as tense and rapidly evolving high risk tactical team events. This section teaches Judgmental Use of Force, Officer Survival, Criminal Apprehension for Patrol, High Risk Warrant Service and Arrest tactics, Basic S.W.A.T, and offers a Shoot House Instructor course. The Tactical Skills Section coordinates the Counter-Terrorism Program designed to enhance the state’s first responder community, offering general, tactical, and investigative counter-terrorism courses to help build essential and critical skills responders need to effectively identify potentials and intentions and respond to mass consequence events. The Tactical Skills Section oversees operations within GPSTC’s mock village. The mock village consists of a classroom and six buildings modeled after structures found in a typical Georgia town—a bank, an office building, a convenience store, a motel, a warehouse and a residence. Training courses that take place in the mock village include: Active Shooter, Counter Sniper II, Officer Survival and S.W.A.T. training. During this training, students learn building entry, searches, and building clearance and use “role playing” scenarios that represent situations an officer might typically encounter. These scenarios enhance training for students because they best replicate the real world. The Technical Skills Section develops courses that prepare law enforcement officers for the challenging physical requirements of the profession. Ranging from beginning to advanced, the practical, hands-on courses that the physical training section delivers teach officers the importance of physical fitness and learning the defensive and survival tactics that will ensure a safe approach to the job. The Technical Skills Section also has Six (6) open labs that can be used for use of force training utilizing training items such as marking rounds, training batons, inert OC, and red TASERs. Scenario based activities and practical based exercises are also performed here. The labs are used mainly for Use of Force Instructor Training, but also utilized for Criminal Apprehension, High Risk Warrant, and Tactical Diffusion. In addition to providing technical skills training courses in a structured format, the Technical Skills Section maintains GPSTC’s fitness equipment and facilities including a state-of-the art weight room, an agility area, a basketball court, a 13-foot deep pool used for dive training, a quarter-mile outdoor track, a 13-prop obstacle course and two padded training rooms used for defensive tactics training.